The Cormo were developed in the earlier part of the 1960's in Tasmania, Australia. To arrive at the current day Cormo rams of the Corriedale breed were crossed with Superfine Saxon Merinos. The name Cormo is from the names of two of the parent breeds, Corriedale and Merino. A trend would develop towards the purchase of wool according to objective measurements and a breeding program should be instigated to meet this demand. In seeking scientific help he learned of large scale breeding trials conducted at Trangie, New South Wales, Australia, by Dr Helen Newton-Taylor, chief geneticist with the Division of Animal Genetics of the Commonwealth Scientific and Industrial Research Organization, in collaboration with Dr. R.B. Dun and Dr. F. Morley. The Senior Sheep and Wool Officer of Tasmania's Department of Agriculture Mr. B.C. Jefferies, devised a breeding program which was based on the Trangie experiments and designed to meet Mr. Downie's requirements. Corriedale rams were crossed with 1200 Superfine Saxon Merino ewes and those progeny which met rigid selection criteria, assessed by objective measurement, became the Cormo ram breeding nucleus. Since the initial cross-breeding in 1960, Dungrove has maintained a ram-breeding nucleus flock within its main commercial flock. The nucleus of 2000 ewes produces sires for both the nucleus and the commercial flock of 8000 ewes. No outside rams are introduced and those within the nucleus are culled rigorously for commercial faults. The top 3 per cent of rams, assessed by these criteria, are retained for breeding. Selected rams remain active in the breeding nucleus for only two years, so there is a rapid turnover of genetically improving sires. Ewes, born either into the ram nucleus flock or the commercial flock, are culled for obvious commercial faults. At the hogget shearing, those remaining are assessed for greasy fleece weight and fiber diameter. Animals failing to meet prescribed standards are eliminated. Each year the ewe yearlings from both flocks help to form the ram breeding nucleus. Management of the flock at Dungrove complements the scientific culling program. Sheep are not housed, rugged or given supplementary feeding, although they graze from 610 to 1000 meters above sea level at an approximate latitude of 42 South where summers are hot and dry and winters cold and snowy. Annual rainfall averages 21 inches. Genetic defects are exposed and culled naturally in this environment, instead of being concealed by artificial pampering. Cormo sheep were first introduced to the United States in 1976 when Travis Jones imported 12 bred ewes and 2 stud rams from I.K. Downie. Both carcass and wool traits are exceptional when Cormos are crossed with existing U. S. wool sheep. The Cormo is not being promoted as a show type sheep in the U.S., but rather as one of economic value. Selections within the Cormo breed is based on a set of four criteria which wer determined to be commercially desirable characteristics. Fibre diameter (17-23 micron range). Fast body growth rate, or body weight. All measurements are taken using instrumentation and laboratory procedures rather then visual appraisal. No pedigrees are kept. 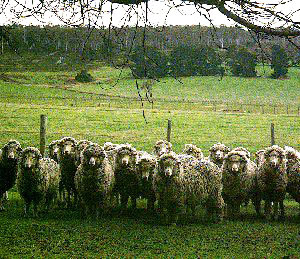 Sheep are numbered and computer management makes the Cormo selection one of the most strictly scientific genetic improvement scheme in the industry.